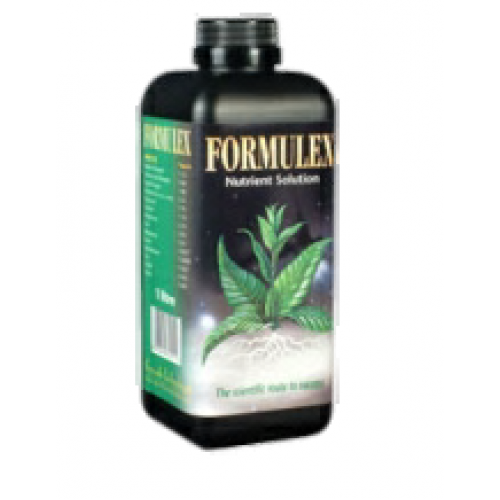 Formulex is an all-purpose mixture of nutrients for either hydroponic or soil gardening needs. It is used across the globe for any situation after rooting all the way through to the blooming phase. Formulex is ideal for use in propagation plugs and cubes for pre-fertilization of young plants. It is a great fit for herb plants on a full feeding schedule as well. Formulex was developed by Growth Technologies and scientifically proven to be 100% nutrient complete, PH balanced and stable with all the macro and micro nutrients to provide all floral and vegetative plants healthy growth and strength. •	The most stable formula full of macro and micro nutrients that stand up to the harshest elements to be available through all phases of growth and bloom. Whether you are growing herbs or flowering foliage, the use of Formulex with its powerful, nutrient rich solution will deliver a completely balanced, versatile and stable feed supply for overall health and strength of your plants.